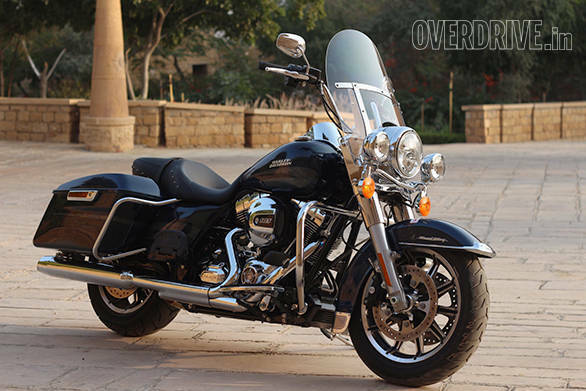 You can tell easily that the Harley-Davidson Road King occupies a special position in the company's lineup. 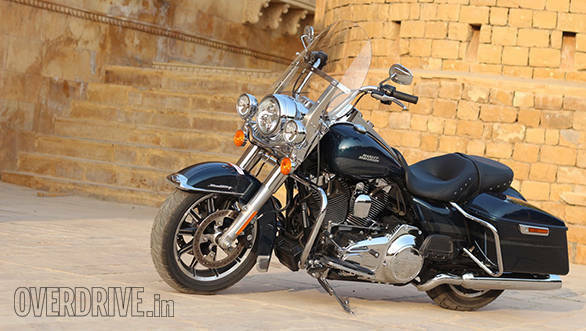 That's because, everyone at Harley India seem to beam a little extra when they exclaim, "The Road King is back!" And it is. The bike disappeared from the lineup for over a year and now the Harley-Davidson Road King has returned on sale. And it isn't just a paint job either, this is the Project Rushmorified Road King. Harley-Davidson set out to make all of its bigger bikes better and more user-friendly a couple of years ago. It led to small changes like brighter lights all round. It also led to more comprehensive updates to interface elements like saddlebags. 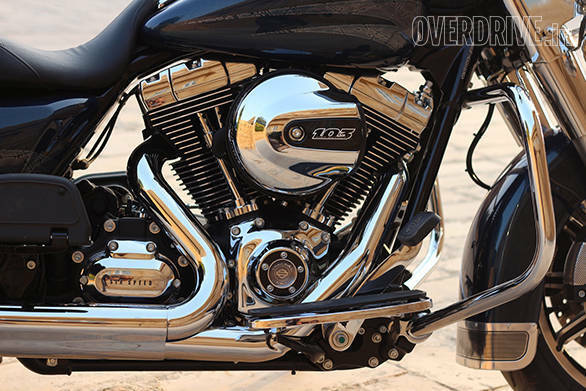 And it led to the introduction of an oil-cooler on the new 1,690cc engine Harley-Davidson called the TwinCam 103. All the changes are here and present on the Road King. What's new on the bike? A lot. First the engine. The TwinCam 103 is equipped with an oil-cooler for the Harley-Davidson Touring family of models. These models also get a counterbalancer which costs a couple of horses in output but makes the engines feel smoother at speeds. The fuel injected engine is also now ride-by-wire ('electronic throttle control' in HD speak). The engine is mated to the 6-speed transmission and obviously, a belt final drive, as almost all Harley-Davidsons do. The Road King also uses a new handlebar to reduce reach and offer a wider more comfy set of bars. The screen ahead of the bars is removable without tools. At the back, the Road King has the new Rushmore saddlebags which feature a simple lever to open the lids. We have used these earlier on a Street Glide and they're very good to use. 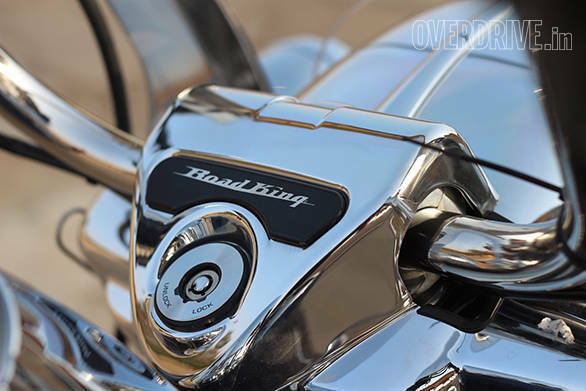 The Road King also has a trio of bright headlamps up front and Rushmore has brought brighter lights all round. Dunlop are the tyre suppliers and they offer a dual compound tyre on the Road King with a hard middle compound matched to a softer edge compound. This is in sync with the Rushmore goal of making the bikes more responsive and quicker in the corners. On the chassis front, the Road King boasts 43mm forks set wider for greater strength and stiffness. At the back, the twin shocks are air adjustable - you can use a valve to add or release air to stiffen or soften the setup to accommodate a heavier or lighter road respectively. Terrific! The Road King looked absolutely gorgeous in this metallic blue shade which sets off the impeccable chrome on the engine perfectly. The typical barrel key is used to unlock the handlebar and saddlebags only. Turning the big chrome knob on the tank top to IGN and thumbing the starter brings the engine to throbby-rumbly life. The gear changes clunk into place but I found the transmission much more positive and assured than I remember from previous Touring models. Performance is very smooth. The engine thrums along happily at speed and I found the Road King very easy to ride from 30 to 140kmph in top gear. As with all Harleys, fast progress is usually about rolling on the gas rather than stomping through gear changes. Having ridden about six hours in all, I found the seat very comfortable and I've no aches or pains to complain of. The new bars are a good move to. My bike's bars were setup a bit too tall for me, but rotating them back and down would produce an effortless position. The Rushmore bikes all show a liquid suppleness that works wonderfully on good and moderate roads. The Road King is effortless. However, the new setup has made these bikes worse when it comes to dealing with sharp-edged bumps. The Road King thwanks hard through these and it's a wince-inducing sound. However, a Rushmore Street Glide I tortured through some really, really bad roads a couple of years go also made these noises but shrugged it off producing no harm despite an extended run. I did have a brand-new bike and the brakes were yet to be bedded in but I liked the way they felt. I would have enjoyed a little more initial bite but I cannot complain - whenever I needed to shed speed in a rush, they proved utterly trustworthy. 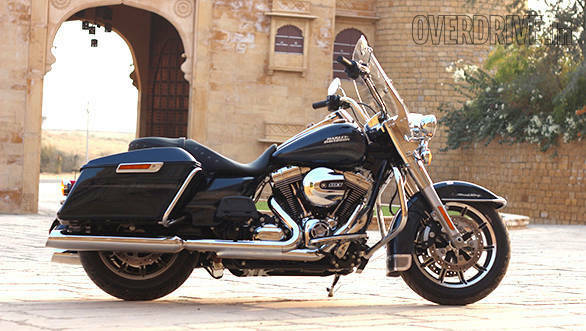 The Harley-Davidson Road King looks stunning but that isn't the main reason to buy it. I suspect that it manages to sit exactly at the cusp of the nostalgic all-chrome Harley and the highway-going Touring-family model. I really enjoyed the fact that it does both of those things so well. The Road King is not cheap, though. Harley India's website lists prices starting at Rs 25 lakh ex-Delhi. For the money, you get a very smooth, very impressive Harley-Davidson that'll be easy to ride about town and effortless down the highway.